Sunny, sheltered spot. In cooler climates grow under cover to ensure fruiting. Requires lots of heat to ripen fruits. Pomegranates are self-fertile, so single plants fruit well. Fertilise with a balanced organic fertiliser in November and March. Lavender, Cosmos, Zinnia, Sunflower, Nasturtium and Coreopsis. Pomegranates grow into tall, dense shrubs that shade out other plants. Set out plants grown from rooted cuttings in late winter or early spring. 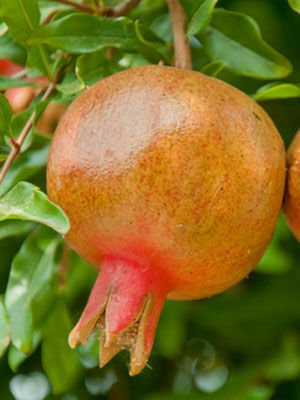 Named cultivars produce better than pomegranates grown from seeds. Prune outdoor plants in spring, and indoor plants in early winter. Remove dead, broken or crossing branches as well as any suckers that have appeared at the base of the plants. Harvest when ripe. The fruit stores well in the refrigerator. Pomegranates often do not start bearing until they are five years old.